Subject to 6% Gov. tax and RM2 Delivery fees. 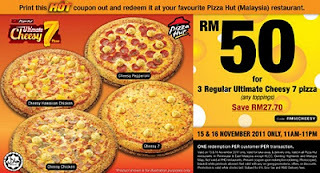 Win RM100,000 or Panasonic 40" LCD or iPad 2 with Pizza Hut Ultimate Cheesy 7 sms contest!